This is the time of year, most of us become disillusioned with our lawns. Water, aerate, water, reseed, water, fertilize, then repeat and that doesn’t include the mowing. It’s a never ending cycle. Customers send emails wanting to know how they can forget the grass and have something that is just not as time consuming. Well…there are lawn options and planning is a must or you will be the neighborhood poster yard for weeds. Why not use ground covers as lawns? 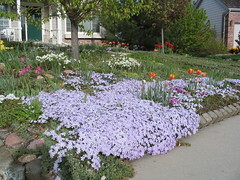 Ground cover plants,ornamental grasses and perennials are popular, but we have more ideas. Here are more ideas with pictures should you decide to go lawnless in the future. Lawn Substitutes, More Lawn Substitutes, Even More Lawn Substitutes. Check out Ground Cover Plants at Greenwood Nursery.